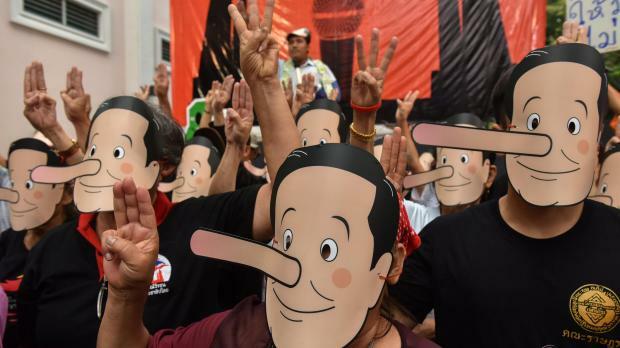 Activists say junta leader is a "liar"
Hundreds of pro-democracy activists in Thailand wore cartoon masks portraying the country's junta leader with a long nose on Saturday, calling him a "liar" for delaying a general election promised this year. The junta has promised and postponed elections several times since it came to power following a coup in 2014, with the latest date set for November. The military-appointed legislature changed the election law last month, signalling another delay to early 2019. That sparked a series of anti-junta, pro-election protests that have gained momentum in recent weeks with gatherings taking place in several provinces across Thailand. 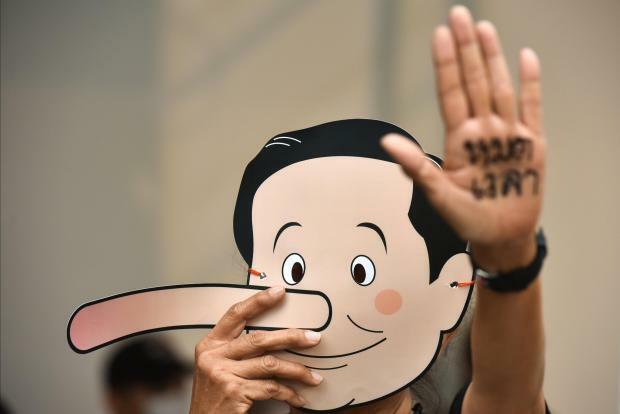 On Saturday, around 300 activists congregated at Bangkok's Thammasat University, wearing and distributing paper masks resembling Prime Minister Prayuth Chan-ocha to Pinocchio. One of them, Sirawith Seritiwat, said the mask was called Yuth-nocchio - a reference to the infamous fictional character whose nose gets longer every time he lies. "Enough with the lies. Time's up for dictatorship. It's the people's time now. We must vote this year," Sirawith told the crowd. Activists also held up three fingers, which they said symbolised their demands in the slogan: "Elections must take place this year. Down with dictatorship. Long live democracy." Around 100 police officers were deployed at the university but they did not interfere with the event. Officials have so far not commented on the latest spate of protests, but last week a spokesman for the junta said it was not concerned by the protests and would rely on the police to maintain peace and order. Prayuth said earlier this week young activists should focus on their studies and "not think they have to change the country." Protests are planned for every Saturday in March and May in Bangkok and other provinces, with a large gathering between May 19-22 to mark the four-year anniversary of the coup. "We urge everyone in the country to come out and join us," said Rangsiman Rome, another activist in Bangkok. "It's time to take back our future. Prayuth and Prawit must go," he added, referring to another junta leader Prawit Wongsuwan. Watana Muangsook, a member of the Puea Thai party which has won every election in the last decade, also came to Saturday's gathering "to show support" to the activists. "People have the right to demand elections," Wattana said. The junta lodged a lawsuit last week against seven activists for inciting unrest and 43 protesters for illegal gathering after a protest last month at the Democracy Monument in Bangkok that also involved hundreds of activists.